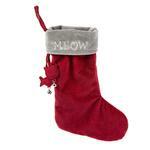 Keep your kitty happy this Christmas with their own HuggleHounds Holiday Cat Stocking Snowflake! This sweet HuggleHounds Holiday Cat Stocking is the perfect way to keep your cat apart of the family with a stocking. This stocking has a beautiful red snowflake design with ribbed top. Great for Christmas gifts. Matching scarf or dog stocking sold separately. 12.25" x 8" x .25"
I love the great harnesses and cute outfits on this site.